Thanks to NMS’s 50 Years of Television exhibition, Gwen Pew learns a few interesting facts about the history of TV in Singapore. The fondly-nicknamed ‘TV Tree’ outside the exhibition entrance. Image courtesy of the National Museum of Singapore. 31 Dec 2013: It’s hard to imagine a time without TV, but it was only 50 years ago that television officially arrived in Singapore with the launch of TV Singapura in 1963. 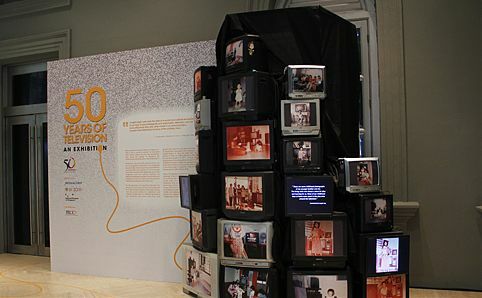 To mark local television’s golden jubilee, the National Museum curated an exhibition to take us back in time for a look at the development of the box set and local programming through the years, with antique TVs and filming equipment, as well as the way it has shaped our lifestyles and cultural habits. Here we round up a list of ten interesting facts we’ve learnt from the exhibition. 1 While Singapore’s first TV station was launched in 1963, only about 1.5 percent of the population owned a TV set then, and it was common for households to share it with their neighbours. By 2009, the figure rose substantially, with 98.5 percent of Singporeans owning at least one set. 2 During the ’60s, TV-watching used to be an extremely community-based activity, especially since it was so expensive to own one back then. There would usually be one set at a local community centre, and people would gather around it in the evenings. The government also took advantage of that to broadcast public service announcements and other messages en masse. 3 There is – and has only been – one main local TV station in Singapore, but it has gone through several name changes over the years: TV Singapura (1963), Radio and Television of Singapore (RTS, 1965), Singapore Broadcasting Corporation (SBC, 1980), Television Corporation of Singapore (TCS, 1994) and, finally, the present incarnation: MediaCorp (1999). 4 The station used to be owned by the Ministry of Culture until 1980, when the government decided to hand over the reins to a private company – it remains privatised today, but as with all media on the island, content is still subject to government regulation. 5 A local electronics company called Setron used to produce TV sets in Singapore – at just $1,750, it was almost half the price of imported ones, which would cost around $2,900. 6 The first TV remote control – invented by Robert Adler in 1956 for Zenith Electronics – was included with several TV sets displayed at theVictoria Memorial Hall for public viewing. It had four buttons and its only function was to allow people to change channels from a distance; nevertheless, Zenith Electronics were so proud of the new technology that they decided to name it the ‘Space Command’. 7 Colour TVs were first introduced in 1974, but initially were not very popular in Singapore, since people then considered it an unnecessary update. This changed, however, when it was announced that Singapore will be live broadcasting the World Cup finals later that year – 2,000 sets were sold in three days after the news announcement, just in time for the event. 8 A huge Bosch colour TV camera from 1974 – on loan from MediaCorp for the exhibition – was one of the first to be used in the country to film in colour. It had significant limitations, however – the screen of the viewfinder still appears in black and white, so it would take two to three hours to adjust the colour settings before each shoot. Cameramen didn’t know exactly how the colour would turn out until the reels were viewed, so there was a lot of trial and error involved. 9 The Awakening, the first locally produced Chinese epic drama series, debuted in 1984. Starring Xiang Yun and the late Huang Wenyong, it attracted a record-breaking viewership of 822,000 – before the ’80s, most content consisted of local news, sports and variety shows, plus imported programmes. 10 Samsui Women, which aired in 1986, was the first Mandarin drama to be dubbed in English.